I am sorry I have not responded to everyone’s thoughts and condolences, but thank you it is so greatly appreciated. I still have not come to terms that I lost this very special horse. I was going to sell Finn because I knew he could do great things, far beyond what I could ever give him. He was so kind, loved children, and attention from anyone and anything. If you looked in his direction he would knicker at you. 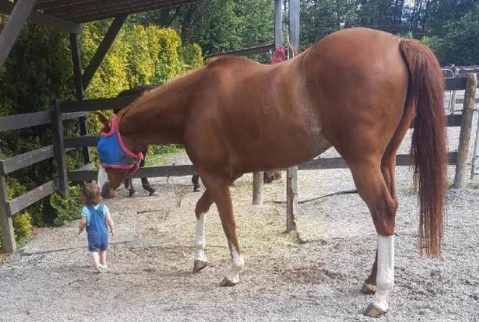 On Friday, He jumped out of where he was grazing came up the road and turned to the right, probably heading to the equestrian center where he was always ridden. I ran after him. A lady was distracted with her child, did not see him, hit him from behind with her car and broke both of his hind legs. They were almost completely severed. He dragged himself into the ditch where cars continued to speed by. A lovely lady from a neighboring farm jumped on his neck and stayed with him comforting him while he was thrashing in shock. She was hurt in the process. I called everyone I could for help. The vet arrived an hour later and euthanized him as I kissed his white nose one last time. Shaun held him too, and felt his last heart beat. I do not have children, my animals are my children and I am grieving like I have lost a child. I’m am writing this sitting in the driveway at the farm watching cars continually speed by on the newly paved road. Unless something is done, it will happen again. The Alouette Valley is an area of great natural beauty which supports many large and small species including eagles, owls, bear, deer, bobcat, cougar and mink. 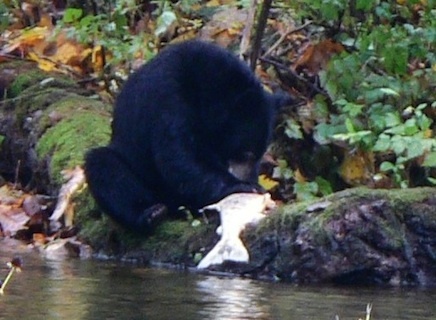 The Alouette Valley boasts two salmon-bearing rivers which underpin its ecology. 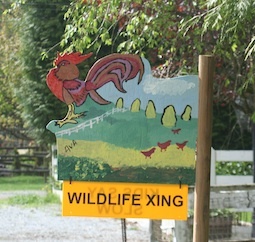 Sadly, many of the creatures of the Valley are under siege as habitat is lost to development and fast-moving traffic. We welcome the many new neighbours that have moved into the development area and those that enjoy using the Recreational Trail on 132 ave. and the Alouette Rivers We would like to encourage our new neighbours to help us protect the Valley and improve this important resource for all to enjoy. We will continue to push for improved trail linkages on 224 str. to make continuous recreational routes throughout the entire valley. 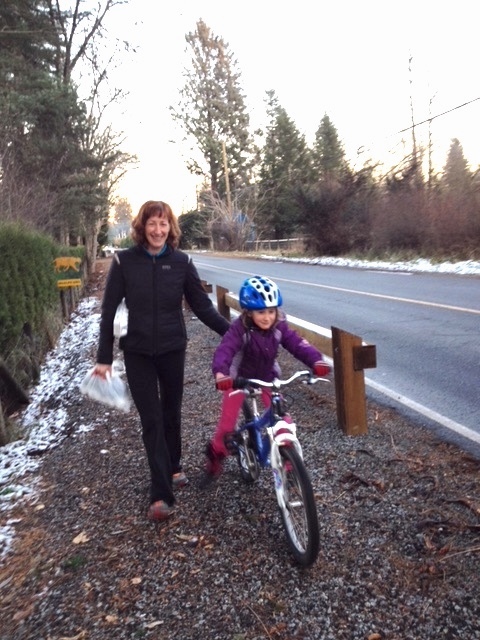 Despite the many complaints about traffic noise the 132 ave. trail is proving to be one of the most popular street multi-use trails in Maple Ridge. If we can calm the traffic and add linkages it will become an important and valuable destination trail for the entire city. We are requesting that those of you that share our goals help us by signing our traffic calming petition. Comments made by people signing our the petition (Updated June 6, AM). Our Summer “Park” the Street event was a great success and there were no major problems. We received a few tickets and had to move some of the equipment off the shoulder but otherwise plain sailing. Thanks to all the motorist, runners, walkers and cyclist who stopped to express their support. Seems like we are not alone in being fed up with out of control speeding motorists and many would love to see 132av as a recreational street and not a racetrack. Here are a bunch of pictures of the event. 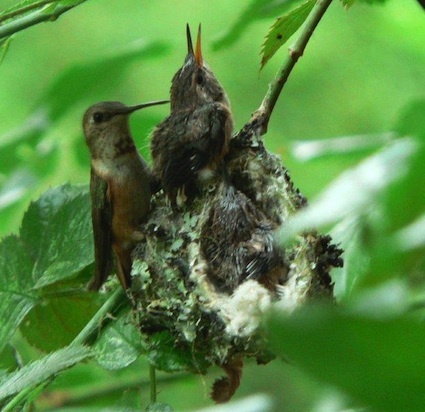 Click here for a Gallery of Lynn’s Beautiful Hummer Pics. in High Res. We are excited to be partnering with Maple Ridge News and Wildplay Element Parks to hold a photography contest, ”A Year in the Life of Alouette Valley” . AVA members have put up signs in front their homes to encourage people to slow down when driving in the neighborhood. The signs are hand painted by neighborhood kids and residents. This project is a part of the Recreational Roadway Initiative which AVA and SVNA are proposing. After the severe flooding and devastation to properties in the winter of 2006 and 2007, residents in the Alouette Floodplain grouped together in April 2007 to form the Alouette Valley Farm & Homeowners Association. The name of this group has since been changed to the Alouette Valley Association (AVA). The group originally made it an objective to specifically understand and focus on the problems and issues regarding flooding of the North Alouette River. Since then AVA has expanded its mandate and has become a force for positive change in the Alouette Valley. 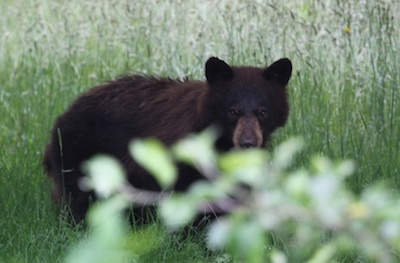 Protect the fragile environment of the Alouette Valley. A key component of this has been to fight for the North Alouette River which has come under a great deal of pressure from both development and irresponsible agricultural practices. AVA in conjunction with ARMS started the Save The Alouette website in response to the illegal pumping of water from the North Alouette River by the Golden Eagles Group. The proposal is to designate certain roads as recreational multi-use facilities that not only service cars, but whose prime mission is the service of people. The proposal will result in safe recreational links between Maple Ridge Park, Horseman’s Park, the Equestrian Center, the dike system and the new 136th Street horse trail. We believe that this is a unique opportunity to enhance the lives of the people of Maple Ridge and it will attract a number of economic benefits to the area. The proposal supports and enhances the principles of the Silver Valley Area plan by increasing community inter-connectivity, and developing corridors for multi-use recreational activities. 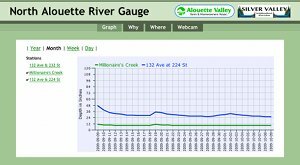 The Alouette Valley Association initiated a river gauge project in 2008. 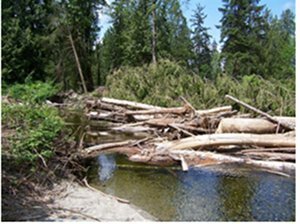 The purpose of the project being to monitor the flow of the North Alouette River and to provide an early warning for residents who may be in danger of flooding during high rainfall events. The District of Maple Ridge kindly contributed funding for a second gauge at 224 Ave.
A goal of the AVA is to ensure that the District of Maple Ridge and the Agriculture Land Commission enforce bylaws and rules when it comes to activity in the floodplain that might negatively impact the residents. 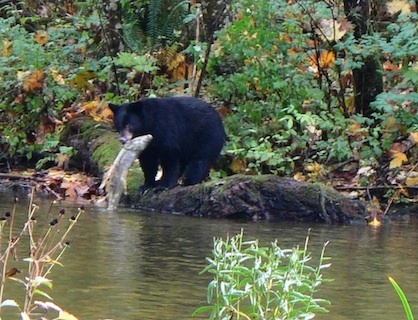 A hydrology study has been conducted by the District of Maple Ridge in conjunction with B.C. Hydro, and we are awaiting the results of that study and are attempting to get the District and the ALC to delay any permits for fill until that study has been delivered and impacts can be determined. Stay tuned. Visit the Alouette Valley Forum to discuss this proposal or to view an archive of information about the area. The road signs are attractive, have been well received and definitely seem to have an impact on day-time speeding. Where can I get one for my place? Just send an Email to ava@stargate.ca. There is a bit of a waiting list at the moment. Well done, AVA, a timely and enlightened initiative that is bound to encourage others in M.R. We can have a positive influence on their own communities if we decide to. We would like to have a Sign put at the front and back side of the South Alluette river bridge on 224th st ,reminding drivers of the crossing speed when horses are on the bridge or when passing a horse to slow to 30 k as per the Municiple Law. The progress made by AVA to develop an effective political voice in the Yennadon (North Alouette region) is most amazing. The first volume of your newsletter is well done also. ARMS and myself gives AVA a big hats off salute for caring and protecting the creatures of forest, field and stream. Furthermore, your efforts to make your neighbourhoods safer by road calming signs are a great first step. More applause and kudos for the work the association is taking on. The concepts you are putting forward are well-thought out, well-planned and the very essence of participatory democracy. Thank you for looking after your corner of the world and for sharing the results with the rest of us. It takes vision of your kind to set the example for the rest of us to follow. We will start to see real results once enough groups take on collective ownership of all that takes place on the land and we go from patches of caring people to a carpet of well-loved communities. The First Nations are way ahead of us on this one. I tried to link into the survey re the Adventure Park proposal for Maple Ridge Park but I got an error message.. Says I don’t have permission to do the survey? Plus… we still owe you $20 for our sign.. who should I give this to? Or mail it to? Do you have your membership form ready yet? Cuz we’ll join. You are doing a terrific job – AVA stays focused and fact based and doesn’t go down the path of the tiresome environmental rhetoric. It strengthens your positions! Thanks from a resident who is grateful for your hard work. I love the roadway plan for 132 Ave by the way – I get a cardio workout everytime I walk Barkley around that curve to 232. I’ve take to walking through the horse trail instead! A comment re that wee trail! Thanks to Maple Ridge Parks and Rec for cleaning out the dumped christmas trees and wavy willow that some goofs dumped. Yeesh! 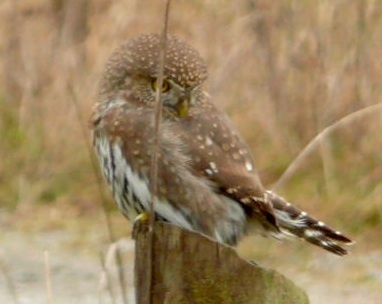 The grass twig is a natural for the Pygmy Owl. What a chance opportunity I had and well worth taking the snap shot of yet another wildlife phenomenon in our valley. My husband commented “How was I able to spot the little one”? I told him “Something just looked unusual sitting on the fence post”, so I took a closer look. Very impressive work all around. We are hoping to adopt a similar format on our road. River Road. We also enjoyed your presentation to the Committee of the Whole pertaining to the Recreational Roadway Proposal. Well done. A great model for other communities!